We have also been thoroughly trained in biology, ecology, and behavior of the Giant Canada Goose. Staying up to date with the newest control and deterrent methods is our number one priority, so that we may offer you the most affordable management system. We have extensive experience in both commercial and residential property management fields. This enables us to understand common concerns and strive to meet the highest of standards set by our clients. Regardless of whether your property needs an abatement program by means of highly trained border collies, FlightControl Plus applications, habitat modification, egg depredation, or other humane deterrent methods, we are confident that we can design the best suited and most cost-effective plan for your property. Why Choose Stalk and Awe for Your Geese Management? PETA and Humane Society Approved. Thoroughly Trained in Geese Biology, Ecology, and Behavior. Experienced With Both Residential, Commercial, and Municipal Properties. Free Initial Site Inspections and Estimates. 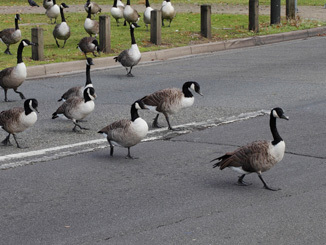 Meet Our Geese Control Experts!